Wilkin County, west of Otter Tail County and bordering North Dakota, has a population of 6,576. The county seat is Breckenridge (pop. 3,386), located where the Otter Tail River and Bois de Sioux River converge to form the Red River. Minnesota’s Breckenridge gets less snow than Colorado’s. 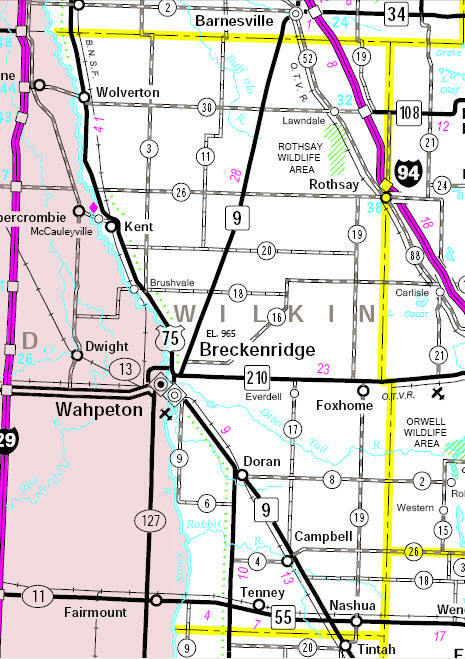 Breckenridge is just across the river from its “twin city” of Wahpeton, N.D. (pop. 7,766). The Wilkin County Courthouse was built in 1929. The town of Rothsay (pop. 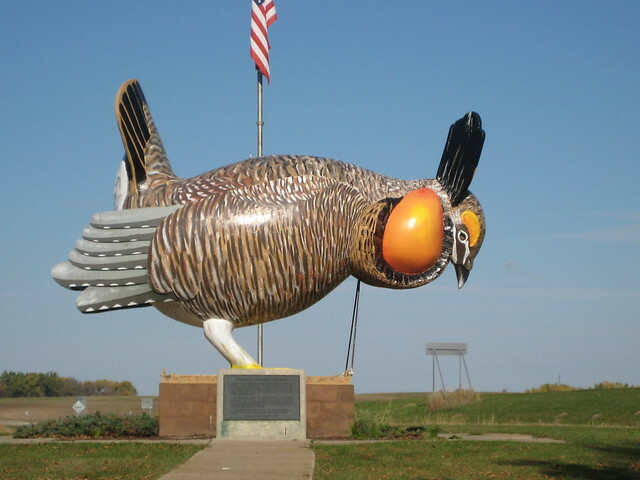 493), located in both Wilkin and Otter Tail counties, has an 18-foot-long statue of a prairie chicken. The town of Tenney (pop. 5) was tied with Funkley (Beltrami County) as the smallest incorporated place in Minnesota until 2011, when it disincorporated. This entry was posted in Minnesota and tagged Breckenridge, prairie chicken, Rothsay, Tenney, Wilkin County. What’s with all the gigantic animals? I agree–one could take a tour of all of them sometime–many seem to be located in the far northern reaches of the U.S.–perhaps because there is more space available? I’ve seen a giant turtle made of rubber tires in northeastern North Dakota and there are a series of about 8 scenes in southwestern North Dakota–on the Enchanted Highway. I remember a horse, some deer, some pheasants.